This page as part of wimax tutorial covers following. Follow links for WiMAX MAC Layer resources which covers wimax network entry procedure, ranging procedure, WiMAX QoS, WiMAX network interfaces, MAC messages (DLMAP, ULMAP, UCD, DCD, RNG REQ, SBC REQ, REG REQ, DSA REQ, CID, SFID, FCH) etc. This page explains what is wimax technology and provides useful links. The term WiMAX stands for Worldwide Interoperability for Microwave Access. WiMAX is used for providing broadband data connection to user similar to DSL. User can be at fixed location or mobile. There are two types of wimax viz. fixed and mobile. For fixed location services fixed wimax has been applicable and for mobile services mobile wimax has been used. Mobile wimax can also be used for providing fixed location services, but fixed wimax can not be used to provide mobile services. As fixed wimax is based on OFDM and mobile wimax is based on OFDMA.These technologies have been developed by IEEE and the standards are 802.16-2004, 802.16e-2005 and latest release is 802.16e-2009. WiMAX support various RF bands 3 to 3.6GHz, 2.3 to 2.4GHz and 2.5 to 2.7GHz depends on country allocations. Different RF equipments have been developed to support these bands. To know more on what wimax system and how it works one has to understand all the wimax evolutions as per IEEE. WiMAX has greater coverage diatance than WiFi or WLAN. WiFi cover range of about 30 m, while WiMAX cover radius of about 50 km. WiMAX should be able to support data rate of about 70Mbps theoretically with higher modulation scheme such as QAM. 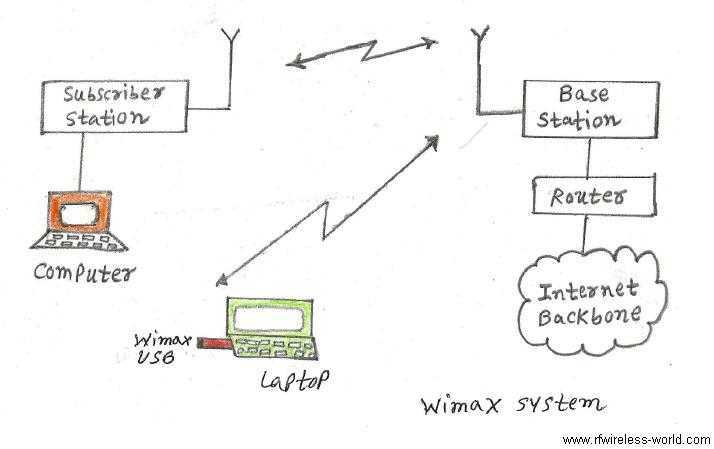 As mentioned in the diagram above there are two main parts in wimax system. Base station and subscriber premises equipments. Base station is connected to internet backbone using ASN-GW. Subscriber premise equipments include Modem and antenna. As mentioned wimax subscriber modem is directly connected to desktop computer or is connected to LAN or router to extend the support for more than one devices i.e. multiple laptop,mobile can be connected to the wimax data connection simultaneously. In the case of mobile wimax, user equipments such as USB dongles,mobiles,tablets can be directly connected to Base station for interenet connection.